I finally was able to make the layout for the challenge. This time the challenge is to use a minimum of 7 flowers, the premade kind, not homemade, the more flowers the merrier! I wish I could use more flowers for this layout ( I have something else in mind ) but this is the best I could do, while having a toddler who is curious about everything. If there is an award for scrapping yelling mom, I’m sure I could win one..huhu! I’m using old patterned papers I have. I think it’s Daisy D’s. The flowers are all Prima which I bought a few years ago. This time I am a little wiser as I embellished them with buttons and bows of crochet thread. If you count the one I stack on top of each other, I managed to use about 9 flowers for this layout..heh! 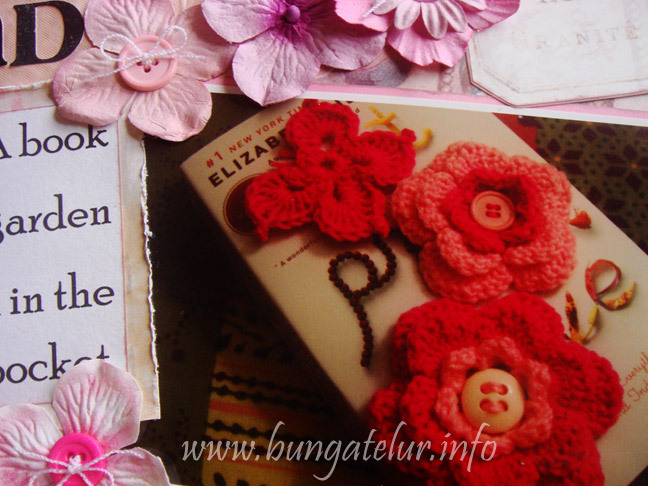 I crocheted those pink flowers and butterfly as a friend requested a hair clip for her daughter. So I need to take a picture and show her how the flower looks like before I could proceed with the next step to sew the felt hair clip cover. 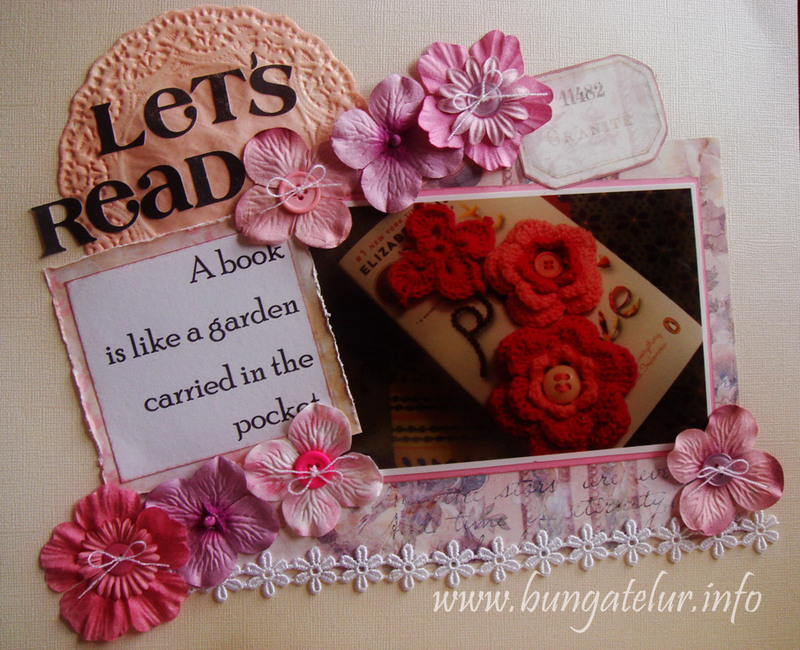 And since I am currently reading Eat Pray Love by Elizabeth Gilbert, I put those crochet flowers on the book and just snap some pictures. 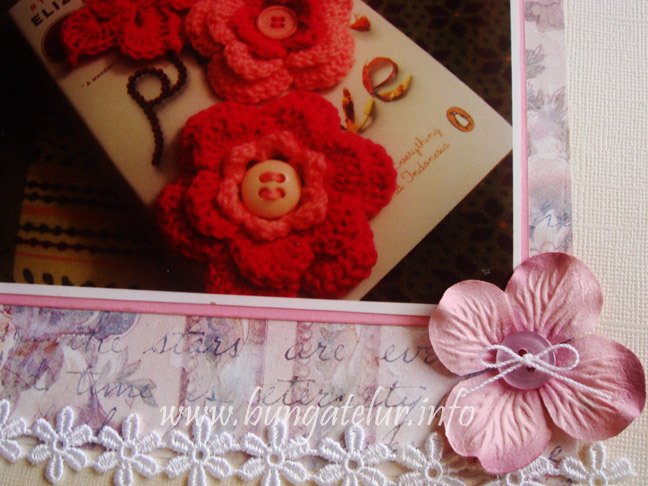 Oh, this is also the first time I used doily in my layout. I distressed the doily with Tattered Rose ink. I wish I have a darker pink color to distress its edge. Well, that’s another reason to stash some more scrapbook stuff..huh! Still in the effort to make do with whatever craft stash I have in possession, this time I am using the 6 x 6 paper pad and baker’s twine I bought from Shirl many months ago. It is the My Mind’s Eye Fine and Dandy collection. I am interested to use the hanging banner pattern after seeing how others implement it in their layout. This is also the first time I tie the twine inside the button hole. The first button was done quite well since I cut the twine quite long. For the second button with yellow twine, I decided to be frugal and cut it short before I tied them..damn..it was hard to fumble with a just-enough-length of twine..as you can see the twine ends all loose up as the consequences..huhu! 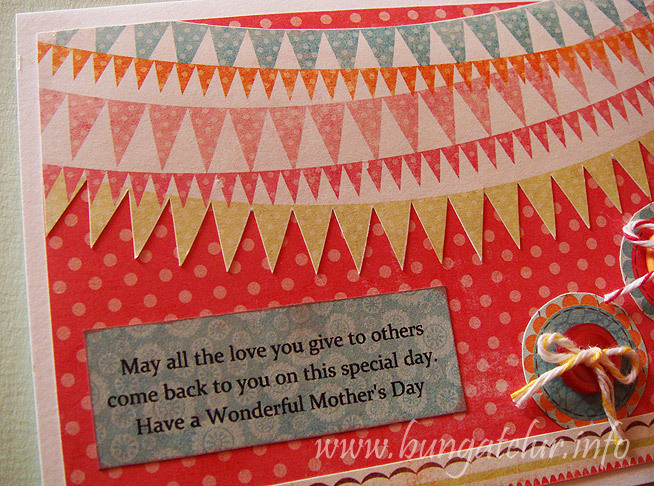 I also tried to print the Mother’s Day sentiment on patterned paper. I printed a trial piece on plain paper and then I glued the piece of patterned paper at the area where the first piece was printed on. I should have use repositionable glue as the Glue Dots that I was using were too strong..huhu! Well, at least I learned a few new tricks doing this simple Mother’s Day card. 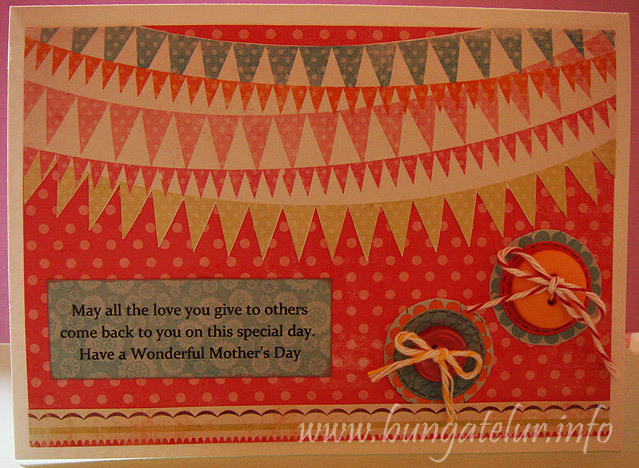 I am entering this card for Simon Says Stamps Challenge – Mother’s Day/Girlie. 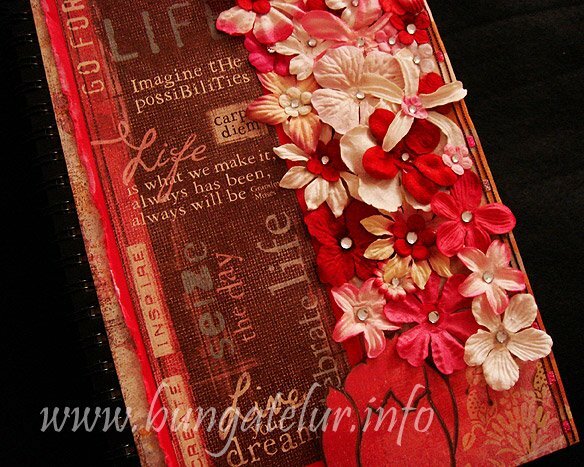 The other day while on FB, a friend mentioned about hoping to get another hand made covered diary. I made one for her when we were like 14..haha! So while rummaging the stack of craft stash I have in my craft room, I found this A5 size notebook I bought at Daiso. I’ve seen many crafters altered the cover of notebook and clip board. I thought perhaps I should try to make one. 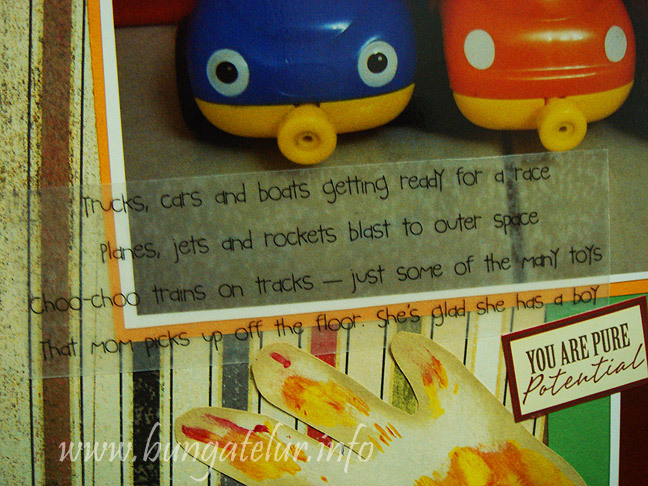 I also found the glossy Mod Podge I bought about 2-3 years ago. Since it should dry clear, I thought it will be a great tool to use to paste all the embellishments and the paper. I’ve seen how Tim Holtz demo using Claudine Hellmuth Studio Multi-Medium, and was really tempted to buy one. But since I have this art resolution this year to make-do-with-whatever-in-the-stash-until-I-can-buy-a-new-one, I thought well, might as well give the Mod Podge a chance. Luckily it works just fine. I used some scrap paper from Basic Grey Perhaps line as the background paper. I found a great sentiments sticker from Kelly Panacci (you know I am such a sucker for motivational wordings) and matted it with pink (fuchsia??) plain cardstock. I distressed the edge and inked it white. Lastly, inspired by a button video from twopeasinabucket.com, I decided to apply the Mod Podge at the right side of the cover and put as many Prima flowers I have that will go well with the color theme. I so love the outcome. Just to put on some more bling effect on the flowers, I glue rhinestones using the same Mod Podge. It dries glossy. 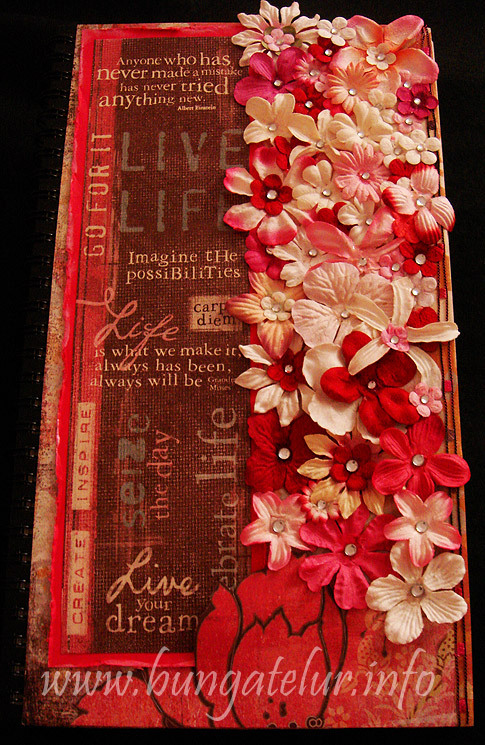 Now I am more excited to create more altered art notebook cover project like this. Next time I will look for notebook with plain black papers in them. Great for making art journaling. 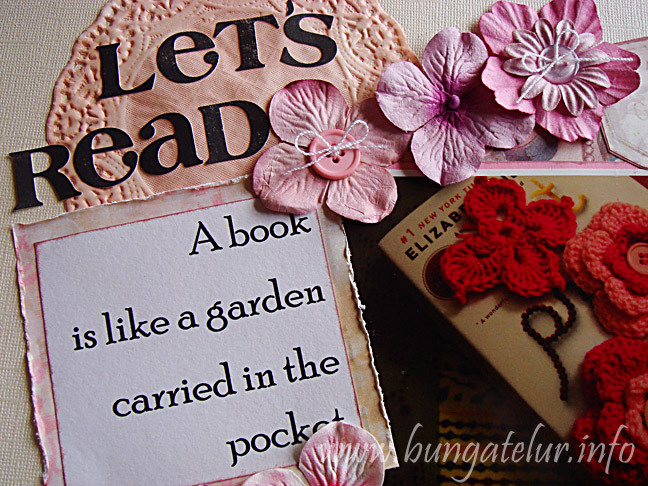 Thanks to Scrap-It-Lah for running this mood board challenge. 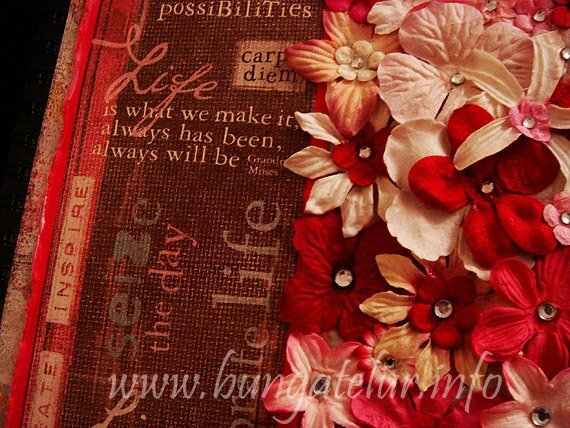 I’ve heard about mood board before but never thought about doing it for scrapbooking layout. It really helps me to get the feel and mood according to the pictures I’ve chosen for this challenge. I’ll tell you more about these pictures. My son has a great problem to fall asleep at night. Usually I will fall asleep before he does. What he will do is to take a few of his toys and play it by the bedside (or rather our mattress side..haha! ), right at Mama’s feet while Mama tries to sleep. 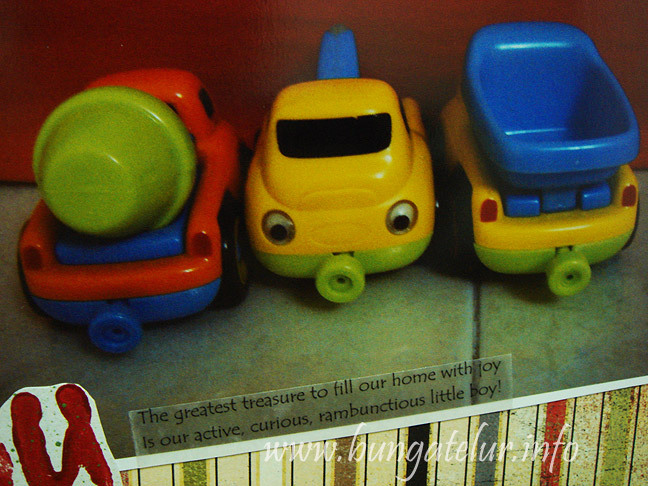 So one day, when I woke up, I found his ELC car and truck toys were lining up nicely according to their type, right by the mattress – car with car, truck with cement mixer and tow truck..well, you know what I mean. I know I have to snap some pictures as a remark of his ability to categorize things. At 2 year of age, this is considered as an achievement in term of child development! So just as the Squidoo suggests, I brought those 2 pictures to my craft room and start putting items that I see fit with the mood of the pictures. 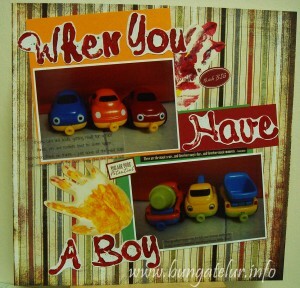 I found those pieces of paper of his hand painted art which I plan to keep and I thought, hey this will fit nicely with the color of those cars and trucks..heh! I gathered many more possible items like ribbons, brads, and even flowers but after leaving it for 2-3 days and coming back to the room later, I decided this will do for the layout. I tried to be less critical and put on more things but somehow I realized that I am just a “less is more” type of scrapbooker. 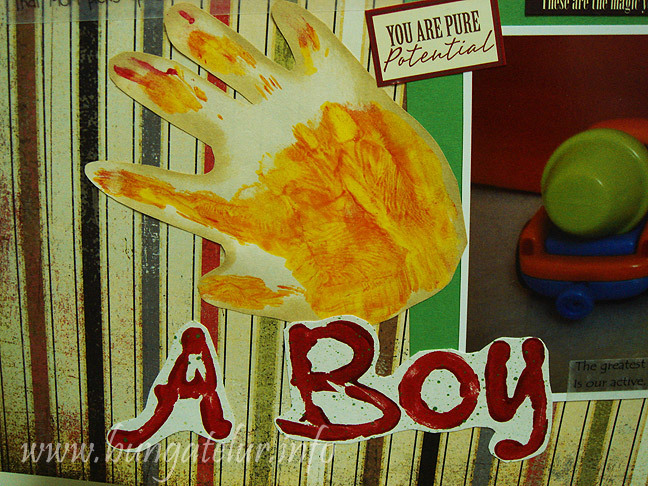 I also found some old vellum sticker that has suitable sentiments about having a boy. And for the title, I decided to stamp the Pebble Inc alphabet foams using acrylic paint and then spray some green paint at the back using the paint brush…(it’s kind of ad hoc decision since I didn’t want to waste the green paint). These days I use the alphabet foams (which I bought since the past 4 years but never get to use them) to teach him ABC while doing some random, fun painting. 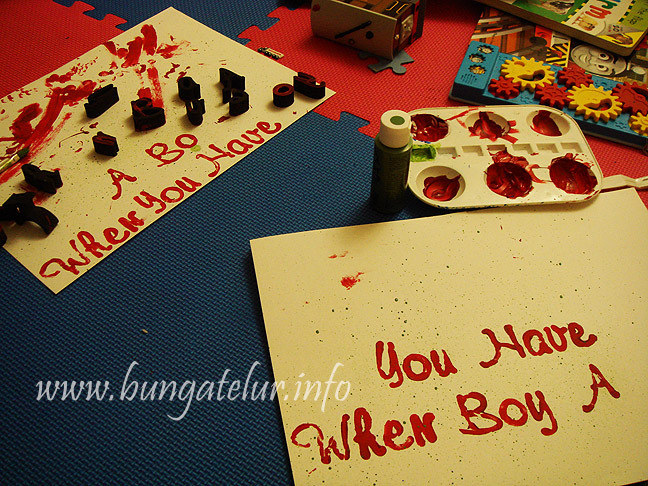 Since my son now loves painting (or actually squeezing most of the paint out of their bottles into palette..huhu! ), I decided to stamp the title with him in the play room. As you can see in the above in-the-making picture, I have to stamp twice as he smudged the first one. Well, that’s life when you have a boy.. I was browsing Shirl’s craft blog and found out about this great challenge at Flashback Friday Challenge. The Flashback Friday 8.0 is to share your first ever 3D project that you have done. 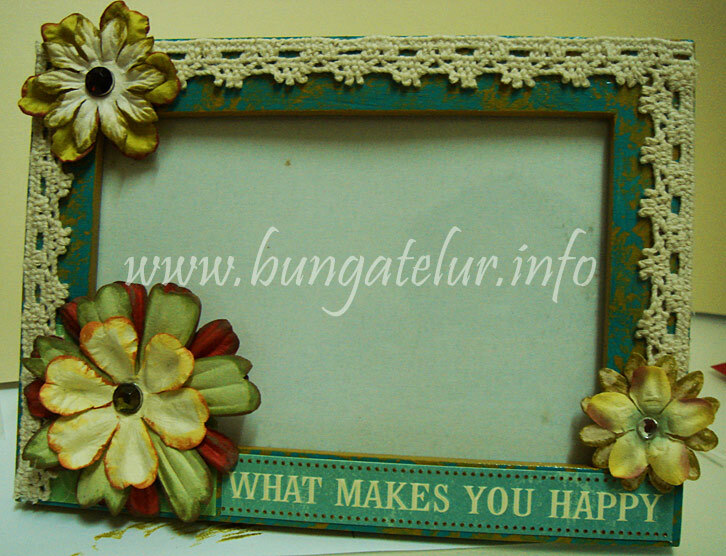 I am so shy to share mine, but the truth is, here is the minimal looking frame I made as a gift to a friend back then in 2007 using whatever scrapbooking embellishments I have that time. 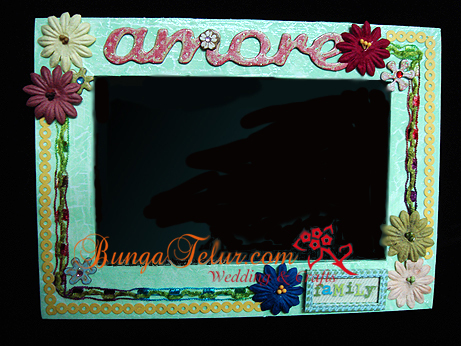 The entry of the novice frame is here Decorated Frame With Scrapbooking Materials. And recently in 2010, I have made another one to be given to Hubby. I put our son’s picture in the frame so that Hubby can put in his work-from-home room. The frame was also entered into a challenge – Flowers and Frills. I hope you can see that I made some improvement in my crafting. Aging does make people a bit wiser over the years, I guess..haha!